BETHLEHEM – A Palestinian state in the West Bank and the Gaza Strip will not be established within the coming 20 years, a member of the Central Committee of the Palestinian Authority’s ruling party Fatah said on Saturday. “Those who believe a state can be established are misled, as negotiations will bring nothing,” he added. Tirawi urged the Palestinians to resume resistance in all aspects as a result. The framework agreement which US secretary of state John Kerry is promoting will be refused by the Palestinians, added Tirawi. BETHLEHEM – A political committee of 12 members representing the Palestine Liberation Organization’s various factions convened in Ramallah and agreed on recommendations to take the Palestinian plight to the UN and its various bodies, a PLO official said on Saturday. Hanna Amirah, a member of the Executive Committee of the PLO, told Ma’an on Saturday that the committee recommended addressing the United Nations regardless of whether the ongoing peace talks make any progress or not, although he added that a date had not been set. The goal of these recommendations, he said, is to enhance the Palestinian position. However, Palestinian Authority president Mahmoud Abbas and the PLO Executive Committee need to approve them before they can be put into effect. The Palestinian Authority is currently trying to counter demands made by the United States and Israel, added Amirah. He asserted that the recent suggestions made by the US Secretary of State John Kerry were completely unacceptable to the Palestinians. He highlighted that the proposals made related to Jerusalem, to Israeli settlements, and to Palestinian refugees were unacceptable in particular as well as the proposed Israeli military and civilian presence in the Jordan Valley. Earlier this week, PLO official Wasil Abu Yousif, who is a member of the PLO’s political committee, said the committee agreed on prerequisites the PA needs to fulfill before signing international conventions and joining UN agencies and different bodies. It is of great importance, he added, that the PA joins the International Criminal Court because that will enable the PA to sue the Israeli occupation over war crimes and crimes against humanity. BETHLEHEM – Approximately 10,000 people have been forced to flee their homes due to widespread flooding in the Gaza Strip, according to a report released Saturday evening by the United Nations Office for the Coordination of Humanitarian Affairs. In a comprehensive report on winter storm Alexa’s effects on the Palestinian Territories, OCHA reported that as of Saturday at 9 p.m., 10,000 Gazans had been evacuated from their homes and had gone to either shelters or relatives’ houses. “Several herding communities had their structures demolished (by the Israeli authorities) one day before the storm hit, prompting the UN Humanitarian Coordinator to call again for a halt to demolitions due to their humanitarian impact,” the report said. In Gaza, over 10 percent of the coastal enclave’s greenhouses and field crops were destroyed or damaged by winter storm Alexa, in addition to 50 animal pens, the report said. UNRWA spokesperson Chris Gunness said on Saturday that large regions of the Gaza Strip were a “disaster area” and called on the international community to lift the Israeli blockade in order to allow recovery efforts to proceed. “Any normal community would struggle to recover from this disaster. But a community that has been subjected to one of the longest blockades in human history, whose public health system has been destroyed and where the risk of disease was already rife, must be freed from these man made constraints to deal with the impact of a natural calamity such as this,” he said in a statement sent to Ma’an. The plant was only reopened in 2012 after it was targeted by an Israeli airstrike in the 2006 assault on the Strip. The power plant generates around 30 percent of the Gaza Strip’s electricity supply, while the rest comes from Israel and Egypt. BEIRUT — The Hamas movement has expressed its total rejection of the agreement linking the Red Sea with the Dead Sea, considering it a normalization and legalization to the Israeli occupation. Hamas warned of the agreement’s serious impacts on the Palestinian cause in light of the open Israeli war on the Palestinian people and holy sites. Israeli officials have described the agreement as an historic development that could achieve Herzl’s dream, while environmental groups warned of its serious impacts. The undersigned Palestinian NGOs call on the Palestine Liberation Organization (PLO) and the Palestinian National Authority (PNA) to halt all forms of cooperation with the World Bank-sponsored Red Sea – Dead Sea Conveyance Project (RSDSCP) and to take an unequivocal public stance of rejection to the project. It has become clear beyond doubt that the project is an unacceptable attempt to force the Palestinian population to consent to their own dispossession and to compromise on their own rights. Any lack of a clear position by the Palestinian leadership on this outrageous project, any stand of ambiguity or positive criticism towards it, contributes to the impunity that for far too long has allowed Israel to appropriate Palestinian water and deny Palestinians their rights. 1. The project undermines Palestinian water rights and legitimizes Palestinian dispossession from the Jordan River. Israel unilaterally controls the flow from the upper Jordan River and prevents Palestinians from making use of their rightful share of the lower river’s water. This is the sole cause for the gradual disappearance of the Dead Sea. Instead of addressing Israel’s water theft, the project aims to maintain the unjust status-quo of the river and allegedly “save” the Dead Sea through large scale Red Sea water transfer. 2. The project attempts to replace the river’s natural fresh water appropriated by Israel from the upper Jordan River with desalinated Red Sea water sold at high costs to severely water-dispossessed Palestinians and at pitiful quantities. Even these sales remain merely an “option” and the World Bank studies plan to ‘supply’ only Jericho, which is currently the only water-rich place in the occupied West Bank. With every drop of water that Palestinians purchase, they capitulate to their own deprivation. 3. Neither the World Bank’s Feasibility Study (FS) nor its Environmental & Social Assessment study (ESA) address the grave damage to the West Bank Eastern Aquifer, currently the only source Palestinians have for water supply and development. The Eastern aquifer is rapidly depleting, and its water table is dropping at an alarming rate – both as a direct result of the shrinking Dead Sea. Consenting to the project entails closing an eye to the rapid destruction of the only other water resource in the Eastern West Bank. Instead, Israel should be held accountable for the damage it caused to this vital resource on which over 1 million Palestinians currently depend. 4. Far from “saving the Dead Sea”, the RSDSCP will actually destroy the unique features of the Dead Sea and its ecosystem. Under the project, the Dead Sea is slated to turn into a dead, engineered pool of Red Sea water and desal brines, destroying this Palestinian and world heritage site. 5. Both Red-Dead studies (FS & ESA) and the entire conduct of the World Bank lack credibility and transparency, and make a mockery of the alleged consultation and participation process. Throughout the process, the Bank has systematically turned a blind eye to Israeli violations of Palestinian water rights. The Bank repeatedly and deliberately ignored key concerns expressed by Palestinians since the project’s inception and during the “consultation” meetings in severe breach of its very own Code of Conduct, as well as the project’s Terms of Reference. In addition, the Bank management has so far refused to make public the results of the Feasibility and ESA studies. The World Bank’s actions are tantamount to a cover-up. Palestinian civil society organizations reiterate their rejection of the Red Sea – Dead Sea Conveyance Project and invite Palestinians of all walks to demand that the PLO and the PNA honor their aspirations for self-determination and justice by voicing a clear, loud and unequivocal “No!” to the Red-Dead Sea scam. This project can only result in further damaging and undermining Palestinian water rights and all cooperation with it should cease immediately. Reparation and compensation for past damages and respect for Palestinian water rights are long overdue and the only way forward. In an interview with Voice of Russia, Palestinian Authority President Mahmoud Abbas replied to an ‘invitation’ by Israeli Prime Minister Benjamin Netanyahu to speak at the Israeli Parliament (Knesset). “If (Netanyahu) wants me to come and say the things I want to say, then I am ready to do it,” Abbas said, according to YNet and other media on November 23rd. However, he had no response to a call for unity by Gaza Prime Minister Ismail Haniyeh. Gaza has a high threshold to suffering, so for a place as poor as Gaza to be hurting, this additional agony means that the humanitarian crisis is at its worst. Even before the most recent crisis, a comprehensive UN report last year said that if no urgent action were taken, Gaza would be ‘unlivable’ by 2020. Since the report was issued in August 2012, the situation has grown much worse. 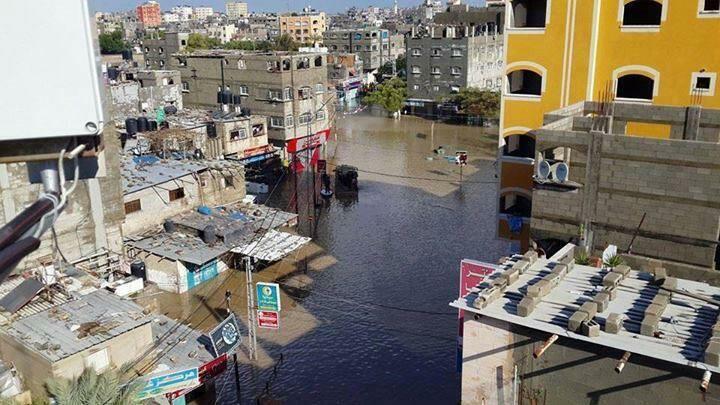 Considering the sea of sewage, one would argue that Gaza is already ‘unlivable’. But for nearly one year, many had hoped that the dramatic political changes in Egypt could in fact bode well for Palestinians in general and Gaza in particular. Gaza was still bleeding from Israel’s so-called Operation Cast lead – the 22-day war of 2008-9 that killed over 1,400 Palestinians and wounded over 5,500 more. The war had destroyed much of Gaza’s poor infrastructure, and the siege made a complete recovery impossible. Then there was the war of November 2012 – eight days of fighting that killed 167 Palestinians and six Israelis. As strange as it may sound, the second war was a source of hope for Palestinians. Back then, Egypt had a democratically elected president. Sure, Morsi at times seemed to behave as a lame duck president, but he sided with the Palestinians against Israel, and helped craft a ceasefire agreement that met more of Hamas’ terms than Israel’s. It was the first time that Palestinians felt that the Egyptian government was truly on their side since the Camp David agreement in 1979. But the ousting by General Abdel Fatah al-Sisi of Morsi on July 3rd changed all of that. The Egyptian military cracked down with vengeance by shutting down the border crossing and destroying 90-95 percent of all tunnels, which served as Gaza’s main salvation. The strip became more vulnerable than ever before. Its haggard infrastructure began falling apart, as Egypt, Ramallah and Israel watched, preparing for various outcomes. Cairo found in Ramallah a willing ally who never ceased colluding with Israel in order to ensure that their Hamas rivals were punished, along with the population of the strip. The New York Times reported on November 21st that 13 sewerage stations in the Gaza Strip have either overflowed or are close to overflowing, and 3.5 million cubic feet of raw sewage find their way to the Mediterranean Sea on a daily basis. “The sanitation department may soon no longer be able to pump drinking water to Gaza homes,” it reported. Farid Ashour, the Director of sanitation at the Gaza Coastal Municipalities Water Utilities, told the times that the situation is ‘disastrous’. “We haven’t faced a situation as dangerous as this time,” he said. Occupied Palestine – The Palestinian Centre for Human Rights (PCHR) expresses deep concern over the deterioration of humanitarian conditions of the civilian population due to the aggravation of the electricity crisis in the Gaza Strip. 3. Calls on the international community to pressure Israel, the occupying power according to international humanitarian law, to lift the illegal closure imposed on the Gaza Strip since June 2007, to fulfill their legal commitments towards the civilian population of the Gaza Strip and to ensure access to all the medicines, food, and basic services, including fuel supplies needed to run the Gaza Power Plant. AL-KHALIL — A statistics report prepared by Quds Press International news agency showed that fifteen Palestinians died since the resumption of the negotiations, three months ago. The negotiation between the Palestinian Authority and the Israeli occupation was resumed in Washington on July 30, for the first time after it had been frozen for three years. Yet the Israeli violations and attacks against Palestinian civilians and their properties and sanctuaries have continued. The Israeli occupation forces have continued killing and attacking citizens and destroying Palestinian properties, indifferent to the ongoing negotiating sessions. On August 26, the IOF special forces committed a massacre in the Qalandiya refugee camp in Ramallah, wounding about 20 Palestinians and killing 3 others. The PA has ignored Palestinian factions’ calls for ending the negotiations, in response to the occupation’s persistent crimes which have led in the past three months to the death of 15 Palestinians, detention of hundreds and displacement of large numbers of residents from their homes that had been confiscated or demolished, not to mention the Judaization projects that continue in Jerusalem unabated and the settlement plans which include the construction of more than 1,700 new housing units. Renewed ‘peace talks’ between Israeli and the Palestinian Authority officials have quietly been going on behind closed doors and a U.S.-imposed media blackout for three months now. Like all previous such exercises they will almost certainly break down without delivering justice or bringing peace. Even though the Palestine Papers made it clear that the leaders of the PA, a creation of the Oslo process, have offered huge concessions in past rounds of talks, pro-Israel commentators are nonetheless pre-emptively rehearsing their arguments to blame the Palestinian side and obfuscate the fundamental longstanding issue: Israeli intransigence. A key – though little known – organisation engaged in this activity in British political circles is BICOM, the Britain Israel Communications and Research Centre. ‘BICOM: Giving peace a chance?’, a new report published by Spinwatch, subjects this organisation to detailed scrutiny for the first time. It concludes that BICOM, like Israel itself, seeks to maintain the façade of progress towards peace, but in practice exhibits deep disdain for international law. BICOM was established in 2001 in the wake of the Second Intifada and increasing international exasperation with Israel. Looking back a decade later, its primary funder, the billionaire businessman Poju Zabludowicz, neatly articulated its raison d’etre: ‘We have learnt over the last 10 years… that the key to creating a more supportive environment for Israel in Britain is convincing people in this country that Israel seeks a lasting peace… As long as this argument remains credible then people will generally forgive mistakes and difficulties even if peace continues to be elusive’, he wrote. So BICOM’s aim is not to contribute to peace, but to convince people that peace is what Israel wants. The professions of support for a two state solution BICOM issues seem to be little more than a rhetorical device to foster, in Zabludowicz’s words, a ‘supportive environment’ in which people will ‘forgive’ Israel for its ‘mistakes’. The existence of a broad international consensus in support of Palestinian statehood is enough to explain why BICOM judges it must pay lip service to the abstract idea of a Palestinian state. But the devil is in the detail. Though BICOM poses as the voice of sensible centrism, its political positions, when subjected to scrutiny, are far from moderate. In practice BICOM opposes key tenets of international law that serve as the framework for implementing the recognised prerequisites of a Palestinian state. It echoes Israeli exceptionalism on the four key issues of the conflict: borders, settlements, Jerusalem and refugees. The following is based on an analysis of BICOM’s own statements. After the 1967 Arab-Israeli War, the UN Security Council passed resolution 242 which called for Israel to end its occupation of territories captured during the war. Following the Israeli government’s unique interpretation, however, BICOM argues that the absence of either the word ‘the’ or ‘all’ from the English language version of resolution 242 when referring to ‘territories captured’, means that Israel need not withdraw to pre-67 borders. This, despite the resolution’s preamble clearly asserting the ‘inadmissibility of the acquisition of territory by war’. On settlements too, despite international consensus on their illegality as articulated in UN Security Council resolutions and reiterated in 2004 by the International Court of Justice, BICOM stands by the Israeli government’s position which is, again, at odds with the international community. Israel disputes the applicability of the Fourth Geneva Convention which outlaws the transfer of civilians into the occupied territories. Indeed, whilst engaging in talks supposedly intended to demonstrate its commitment to achieving peace, Israel yet again announced more settlement construction and Prime Minister Benjamin Netanyahu sent a letter of solidarity to Israeli settlers in Hebron. While BICOM, for obvious reasons, generally tries to avoid spelling out the extent to which its positions contradict with the requirements of international law, Luke Akehurst, who manages the BICOM spin-off group We Believe in Israel, has explicitly challenged the internationally accepted interpretation of the Fourth Geneva Convention. But more frequently, since Israel is in violation of so many laws and UN resolutions, BICOM simply dispenses with international legal principles as an explanatory framework. Instead its stances are frequently premised upon – and justified by way of reference to – what Israelis are ‘willing to contemplate’ or the ‘broad consensus in Israel’. On Jerusalem, for example, BICOM asserts that ‘most Israelis would not be willing to contemplate’ Israeli ‘loss of Israeli sovereignty’ over the city. Thus it endorses the Israeli government’s unilateral rejection of the international political and legal consensus. BICOM’s attitude is illustrated in its use of language too. It euphemistically refers to settlements as ‘communities’ or ‘neighbourhoods’, to the West Bank as ‘disputed’ rather than occupied territory and calls the Jerusalem ‘the capital of Israel’ – though even the United States does not recognise this and therefore maintains its embassy in Tel Aviv. On the thorny issue of the Palestinian refugees BICOM claims that in the 1948 war ‘there was no deliberate, co-ordinated Jewish policy to expel the Arabs’. This Zionist myth has long been disproved by Israel’s so-called New Historians, such as Ilan Pappe, who have shown convincingly that the contrary is in fact true. At any rate, the right of the approximately 700,000 refugees – and their descendants – to return to their homes is upheld in UN resolution 194. Yet BICOM’s take on the refugee issue appears, once more to ignore international law and UN resolutions. Instead it offers the legally insubstantial argument that ‘Israel does not believe it is responsible for resettling the refugees, believing their plight to be the responsibility of the Arab states that rejected the 1947 Partition Plan [and] started the war’. Cutting to the heart of the situation is BICOM’s statement (again couched in terms of Israeli desires, not legality) that ‘no Israeli government will accept a solution that would allow millions of Palestinians to settle in Israel [as] this would effectively spell the end of the Jewish majority’. Even without reference to the return of refugees, BICOM’s research director, Toby Greene, writing in BICOM’s recently launched glossy publication ‘Fathom‘, speaks of a ‘demographic threat’ posed to Israel – and its self-definition as a Jewish state – by natural Palestinian population growth alone. This illuminates the underlying ethnic exclusivism in BICOM’s vision of ‘two states for two peoples’. Just as the ‘peace process’ functions as a fig leaf for continuation of the status quo, BICOM’s lobbying activities – which focus on encouraging the British media to take what it paradoxically refers to as ‘the most objectively favourable line‘ – serve to ward off condemnation of Israel. This seems to be true amongst the strategically vital political elite at least, though grassroots trends show increasing pro-Palestinian feeling. Ultimately it is symptomatic of the tenuous nature of democracy in the UK that by maintaining close relationships at the top – with the likes of the influential Labour and Conservative Friends of Israel groups – BICOM is able to inculcate in the political class the idea that Israel is a benign and reasonable actor in search of peace, while its underlying arguments and Israel’s actions, belie this narrative. The report BICOM: Giving peace a chance? will be launched on the 7th of November. Register to attend the launch event here. – Ramzy Baroud is a media consultant, an internationally-syndicated columnist and the editor of PalestineChronicle.com. His latest book is My Father Was A Freedom Fighter: Gaza’s Untold Story. (Pluto Press). The reigning state of despair among Palestinians has been growing steadily since the end of the Second Intifada. Day after day, the Israeli occupation expands as the options for Palestinians, ostensibly represented by a new generation of the Palestinian National Authority (PNA) eager to seek a “settlement,” grow narrower. The killing has not abated, nor the settlement movement and the Judaization of Jerusalem. The “peace process” track continues as a “strategic option.” But the streets have not come to a rest since the Second Intifada, as they didn’t after the First Intifada and during the period of the Oslo Agreement. Although, the frequency of clashes and confrontations might have decreased, the revolution continues to simmer, awaiting a spark to ignite. Today the situation in the West Bank evokes the period leading up to the First Intifada. The pace of clashes is rising and military operations are intensifying, despite the project for peace. Al-Aqsa Martyrs Brigades – Knights of the Galilee, part of Fatah, claimed the operation in Qalqilya. Some people were optimistic about the movement’s return to special operations and the escape of the Fatah genie from the PNA’s bottle. However, its credibility was soon called into doubt the next day, when it issued another statement also claiming the Hebron operation, which had already been claimed by al-Asifa, part of Fatah-Intifada, which had split from the Fatah Movement in 1983. On Israeli Radio 2, an Israeli security official spoke about the continuing security coordination between the PNA and Israel to capture the “killer” in Hebron. The father of the man from Qalqilya denounced his son to the station. “My son is a killer and deserves to be killed,” he said. But it does not matter anymore. What matters is that Palestinian youth can take the initiative from outside of the quarreling factions and narrow interests of the political parties. Two soldiers were killed in less than 24 hours, something that has not happened since the Second Intifada, whose anniversary falls next Friday. The details of the Hebron operation remain unclear, despite the maniacal security operation, which led to the arrest of a man close to 100 years of age for owning an Ottoman era rifle. The identity of the Hebron sniper is not yet clear, however, and the statements by the factions claiming the operation have not been verified. Meanwhile, military experts in the occupation army have maintained that the sniper was professional and successfully carried out the operation in its three stages: locating the perfect spot, selecting a target, and the withdrawal of security. The sniper picked a soldier standing on open ground, so that the bullet would not ricochet behind him. However, the downside of the operation were the ensuing squabbles between the parties and their lack of credibility, exposed after contradictory statements were issued within less than an hour by two factions with a long history of political disagreements.This negative fallout also plagued the Second Intifada and was one of the most important factors in its collapse. However, the breadth and size of the clashes of last month, especially in the West Bank and Jerusalem camps, could herald a new uprising. Amidst all the fury, a young group calling itself the Intifada Youth Coalition is calling for mobilization and protests to protect sacred sites next Friday, which coincides with the anniversary of the Second Intifada. A video made by the coalition is being widely shared on social media sites. In it, a young man calls for confronting the occupation on all fronts set to a song by Julia Boutros, Ya Thuwar al-Ard, which brings to mind the Second Intifada. Despite differences between the factions, there is a general consensus rejecting negotiations. Several factions launched a popular campaign against the negotiations at a press conference in Ramallah, attended by all PLO factions. However, this was not enough to inspire the Palestinian leadership to halt or even postpone negotiations for one day, despite the fact that three young men were martyred in Qalandiya. It did not even review the “legitimacy” of its choice, which contradicts the consensus of PLO factions, nor did it change its policies or strategies, which seem to be wholly focused on turning “Palestinian life into negotiations.”Seven martyrs have fallen since the beginning of the latest round of negotiations two months ago. They were all from the camps where the First Intifada erupted and caused the most trouble during the Second. It is enough to see the sacrifices of Jenin camp, which was back in the headlines following the martyrdom of Islam al-Toubassi at the beginning of this week. The incident led to a limited military operation at the nearby Jalama checkpoint, before the PNA’s security forces managed to suppress the camp’s anger, prohibiting its residents from reaching the frontline areas. But Jenin is the not the only camp where the revolution is still simmering. In Qalandiya, three Palestinians were recently martyred and clashes continue near the Qalandiya occupation checkpoint nearby. In al-Oroub and al-Fawwar camps in Hebron, clashes have been occurring on a daily basis with the occupation forces stationed nearby, far from the eyes of the media and the PNA’s forces. Current conditions and factors do not provide Palestinians with any other option. Al-Aqsa mosque faces daily raids and there have been calls by Israelis for a million person march on the holy site to coincide with the anniversary of its storming by Ariel Sharon, which laid the ground for the Second Intifada. Popular mobilization against Israel is also on the rise inside the 1948 territories, particularly in the Negev and the Triangle, which also coincides with the October 1 revolt that led to the martyrdom of 13 Palestinians from the occupied territories. It seems the break out of a third intifada is only a matter of time. Friday could be the day the phoenix rises from the ashes. The PNA has cloaked all options following Oslo under the guise of the “national project.” Anyone who objects or dissents falls outside this project. Under this slogan, the Palestinian resistance was liquidated in the West Bank, including the al-Aqsa Brigades, where the PNA’s forces are the only power on the ground. Any weapons not in its hands have become outlawed.The PNA suppressed all action against negotiations, supported by its wide popular base which follows the Fatah movement and the regional winds that put wind in its sails. The PNA has the money and media and is capable of manipulating the discourse. Sometimes it dons the robe of piety, accusing its detractors of debauchery and blasphemy, as it does with the PFLP, for example. With Hamas, accusations of bartering with religion and extremism are mounted. Fatah’s minister of awqaf (endowments) unabashedly declared a fatwa for “revolution against Hamas” and forbade any opposition to the president in the West Bank. In political differences it finds an opportunity to avoid facing reality, accusing others of instigating a crisis. The ill-fated Oslo Accords, signed 20 years ago, have only made Israel more arrogant and open about its disregard of the Palestinians’ national rights. Illegal settlements and their infrastructure now cover 80 per cent of the West Bank, leaving the Palestinians with just 12 per cent of historical Palestine. The occupation has left cities, villages and whole districts disconnected by the Apartheid wall; Jerusalem and its surroundings have been Judaised; the land of the Jordan Valley is being looted. Moreover, Israel is imposing more of its conditions on the Palestinians, including the condition of “recognising its Jewish character” and the power of the Palestinian Authority in its own land is becoming more and more limited. On top of all this, the geographical and political split between the West Bank and Gaza Strip is still in place, which is leading, by means of the Oslo Accords, to the decline of the Palestinian national project. The author is a Palestinian writer. Translated by Middle East Monitor.